As a complete newbie to half marathons, I'm hoping to sponge up the wise words of my fellow team members. First up is Suzie, an Aussie who's perfected the art of good race photos and is aiming for sub-1:40 at Reading. Me (right) with my friend Kate after the Cologne Half Marathon, where I set a new PB of 1:40:08! 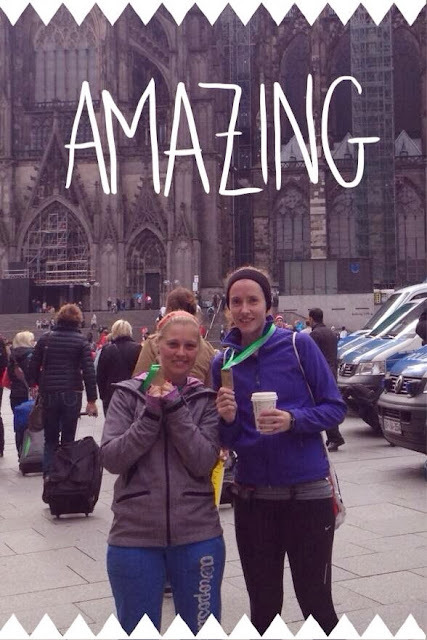 So you've signed up to do your first half marathon. Congratulations. Get ready to start an amazing journey that's about a lot more than just running 13.1 miles or 21.1km. Originally I was going to write my practical tips about what to wear (or not), but there's only so much you can learn from the time when I wore a summer vest for a half marathon and it snowed and I couldn't feel my hands and my arms felt like they were going to fall off. Then I thought maybe I could advise you on diet, but since I don't know what you like to eat and everyone is different, you're going to have to figure that one out for yourself! Just make sure you practice everything in advance. The normal race day tips (Vaseline, bin liners, getting in the portaloo queue early) have all been written about before so other than saying 'smile for the cameras' I didn't think there was much I could teach you. There I can help you. The one thing you will learn from this is that long distance running is about more than building physical fitness and endurance. A friend said to me the other day that he'd been following the blog of someone who had gone from completely sedentary to running the London Marathon. "It must be empowering" he said. "After he ran the marathon, he really felt like he could do anything. Literally, anything he put his mind to. That must be an amazing feeling." A lightbulb moment, and a big grin spread across my face. "You get it! That's why we do it. That's what running is all about." It's about appreciating what your body can do rather than what it looks like. For women in particular it's about rising above the so-called flaws we're conditioned to focus on by endless advertising, magazines and so-called role models. It's about not caring if you have a few jiggly bits. Running let's you consign your body hatred to the past and focus on how strong it feels, and what amazing things it can achieve if you let it. At some point you will realise that what used to be a tough workout is now just a warmup. It's about using every last ounce of what you thought you had in you and discovering there's more there. So much more than you ever knew. You might complain, and whine and hurt and cry (we all do!) but it's in you, and you can use that strength if you want. It's all about finding strength, and character, and heart. It's mind over matter. It's about having a health checkup two years after being told you ought to lose a few pounds, and instead being told you have a resting heart rate that's on par with an olympic athlete. It's about realising that even though they are more toned now, what your legs look like doesn't matter - they can bound up hills that they couldn't even walk up two years before. Realising that this ability is more important to you than how they look. It's about spending time being active, and healthy, and happy. About running your own race and living your own life, regardless of what anyone else thinks. It's a way of life. A mindset. A journey. So congratulations on taking this step to run your first half marathon. This experience may just change your life.